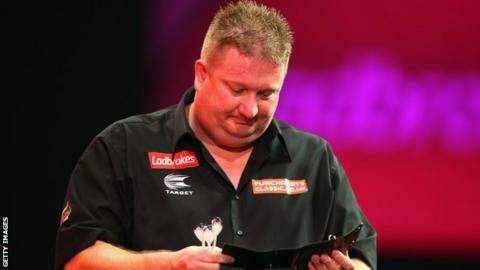 Former PDC world number one Colin Lloyd has said he will leave the sport if his "abysmal" year continues into 2015. The 41-year-old has not qualified for the upcoming World Championship, having appeared in every one since 2000. "If I get six months into next year and feel I'm not competing at the level I want to, then that will be the time to take a step back," he told BBC Essex. "There are so many players that try to hang on for something that isn't there any more," Colchester's Lloyd added. "People might say I'm doing that now - I haven't. There are things outside of darts that I don't want to go into, and they shook my life up a bit. Next year will be a fresh start." Lloyd has appeared at 15 consecutive World Championship tournaments, his best finish coming in 2002 when he reached the semi-finals. But he is currently ranked 35th in the Professional Darts Corporation's Order of Merit, meaning he missed out on being among the 32 automatic qualifiers for the tournament, which begins at Alexandra Palace in London next week. "I'm not going to say I'm finished yet, because I think I'm far from finished," said the 2004 World Grand Prix and 2005 World Matchplay champion. "But this is the worst year I've ever had. It's been an abysmal year. I've had a few things going on in my private life and some other bits and bobs. "I haven't been consistent enough, so roll on 2015 when I can get stuck in again. It's going to take more than 12 months of bad darts to get rid of me." Lloyd says a new breed of darts player, spearheaded by world number one and reigning world champion Michael van Gerwen, has increased the competition and the standard within the sport. "The game is getting tougher. The new generation coming through have got a lot of talent," he said. "We were all trying to get to the level of [16-times world champion] Phil Taylor. Well now, Phil Taylor is trying to get to the level of Michael van Gerwen and Gary Anderson. "It's a great show and the public are loving what they are seeing."